In 2003, Crimson Tears' founder Dave Miller set out to form a symphonic metal band that captured the commercial appeal of bands such as Nightwish and After Forever. The four tracks on Gothika, the band's debut demo, are solidly in the realm of the symphonic/Gothic metal genre and serve as proof that Dave's goal is well within his reach. Fans who devour all this particular genre has to offer will be more than happy to discover what Crimson Tears has to offer, while those who expect every up-and-coming band to offer some sort of refinement or transformation of existing style will most likely find little to like. For those familiar with the aforementioned bands, you know exactly what to expect on Gothika - atmospheric metal bolstered by symphonic arrangements with sweeping keyboards, thick guitar riffs, and of course semi-operatic female vocals. In the case of the latter element, vocal coach Gina Oldham was recruited for the role of frontwoman. While I intend no disrespect for Gina whatsoever, she is not of the same caliber as Tarja Turunen or Floor Jansen. She does, however, possess a strong voice with considerable range that adds a unique flavor to the music of Crimson Tears. Having said that, I found her to be strongest while being in mid-range and less effective at either end. At the low end, such as on the title track, she sounds a bit out of place with the music while on the high end her voice loses some impact and tends to sound too wispy and thin. In her middle range she delivers just the right combination of power and mystique to heighten the effect of the music. The majority of the first track features Gina in her comfort zone, and combined with the lush piano and keyboard atmosphere from Marcus Chapman as well as Miller's precise riffs and snappy leads the song is definitely a highlight of the demo. The seconds track, "My Plea", doesn't measure up to what the band has already displayed with "Eternity". Gina's voice is thinned by too much time spent in her upper range, leaving the song without an effective vocal punch. Dave noodles out a decent solo, but the majority of the riffs are average and repetitious. 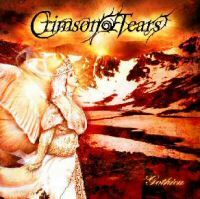 The title track, on the other hand, sees Crimson Tears back at their best. Dave's main riff reminds me a lot of an '80s power ballad from bands like Skid Row and Warrant, but he backs it up with an occasional crunch that dispels any comparison to a hair metal anthem. Gina dips a bit too low now and then, but she's mostly right where she needs to be. Marcus' keys provide a huge backdrop for the rest of the band to lay down a very solid mid-paced composition. Wrapping up the demo is "Gardens of Sorrow", an expansive song that is primarily mid-paced with very a very strong guitar presence. While full effect is given to the keyboards, Miller delivers some fine alternating riffs and sparkling leads, including his best solo of the demo in the latter moments of the song. The band essentially pulls out all the stops on this track, displaying a clear aptitude for creating exactly the kind of metal they've set their sights upon. Is Gothika another example of Nightwish worship? Yes, it is. Having said that, the band has never denied their wish to emulate their influences and capture the sound that has made bands like Nightwish so successful. Crimson Tears is seeking their goal openly and honestly, which is much more than can be said about some outfits. So for those of you who can't get enough of Gothic-inspired symphonic metal, this band is right up your alley.